A recent case study has outlined the success of a Utah school district and their incredible success in implementing green cleaning and other environmentally friendly facilities management practices. School District Goes Green for the Win! Improved student health and performance. [...] successfully reduced the use of chemicals, reinvested tens of thousands of dollars a year, reduced waste by more than 20 percent and almost eliminated job turnover within the department, too. Since changing to an IPM program, Davis has been able to reinvest that $10,000 into monitors, logs and IPM tools. The paper switch also saved the district more than $14,000. Davis also upped their investment into their custodial staff's professional development, resulting in higher retention. It is very difficult to have a great, consistent, green cleaning program without staff or when continually training inexperienced employees. We went from one training a year (approximately three hours) and 26 lessons for our general custodians a full professional development day, quarterly training classes, online resources, monthly newsletters and an additional 2000 training hours to use as needed. With these changes to training and engagement procedures, Davis went from a 16.88 percent vacant positions in 2014 to less than 1 percent today. The reduction of environmental risks, including air, ground, and water contamination. The elimination of unnecessary chemical pesticides and other toxic chemicals. An improvement in publich health and safety. 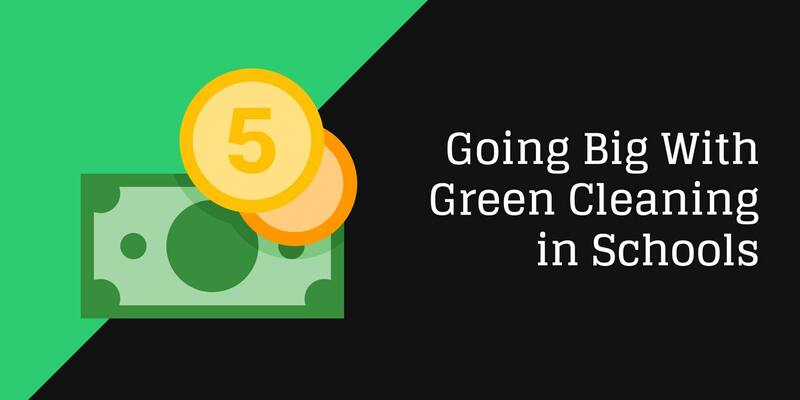 Recycling is good for the environment, and your checkbook. Facility-wide recycling programs can significantly reduce waste management fees, especially when partnered with reuse initiatives that require products that would have been previously disposed of to be repurposed where possible. Reusing and recycling commonly disposed of items can also reduce purchasing cost through vendor buyback inititatives, common with large electronic vendors, or eliminate them completely by repurposing old equipment towards a more appropriate task. Eco-friendly organization may also qualify for State and Federal grants to incentivize increased environmentally conscious behavior. School and workplace recycling programs have also been shown to have a postivie impact on employee morale--translating into greater retention and productivity--as well as increased public image and approval ratings. Waste reduction - Due to their non-toxic nature, commercial green cleaning products are shipped and stored in concetrated form, which reduces the size and number of required containers. Cost reduction - Eliminating the number of chemicals used in the cleaning and disinfection process reduces expenses related to purchasing, training, and chemical management. Health improvement - Eliminating the exposure to toxic cleaning products positively impacts occupant and custodian health, leading to a reduction in health care costs and absenteeism. Green cleaning, integrated pest managment, and facility-wide recycling programs have proven to dramatically decrease costs and toxic chemicals while increasing the health and safety of occupants, as well as organization profits. Providing ongoing traning and incentivization for custodial teams that reduce notoriously high turnover rates in the janitorial industry can prove cost-prohibitive for smaller organizations. Additionally, starting from scratch with an inexperienced managment team and cleaning staff can lead to issues with adoption and potentially lead to program failure. Outsourcing to a janitorial provider with a franchise business model elemenates much of the management overhead and cost associated with these challenges. If you would like to learn more about the cost-saving and productivity improving benefits of green cleaning, integrated pest management, or environmentally friendly facilities maintenance and management practices--contact us today for a free quote!